In barely 15 years, the wines from Priorat have gone from obscurity to the most expensive in Spain, with an international reputation for high quality. Yields in Priorat are low, and the grapes are small. However, this leads to a greater concentration of taste. The steep slopes ensure the vineyards have less direct exposure to sunlight than other wine regions, so the fruit has a different structure, with better acidity and lower pH, and less prone to oxidation. The wines produced are dark purple in colour, with a high alcoholic level (15-16%), and a typical mineral taste. The high acidity, pH 3.4 or less, helps enliven and freshen the wine. 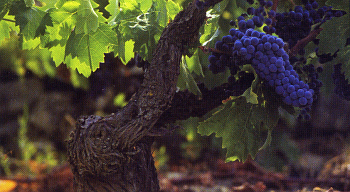 The classic grapes of the area are the garnacha and cari�ena. Forty percent of all vineyards in Priorat are growing the garnacha since it thrives in a hot, dry environment, is fruity and rich in sugar. Half of the vineyards cultivate the cari�ena, which contains a lot of tannins. French cabernet sauvignon and syrah are also grown, producing wines of great complexity. Priorat's unique vineyards produce a wine of unusual quality, but the recent success would not have been achieved without human ingenuity and a resolve to outshine the competition. Priorat is a hotbed of wine innovation, with many variations in practices such as retention of stems, maceration times and use of new oak barrels for two years before bottling. Wine growers are provided with technical help by wine cooperatives. Visits are made to major international wine fairs to see and taste the competition. Vineyards are harvested separately to demonstrate to the individual grower the objectivity of the payment system, which varies by a factor of 12 depending on the quality of the grapes.